Kuyenda is an undeniably charming and rustic safari bushcamp located deep in the South Luangwa National Park offering guests a true taste of the African bush. Set beneath a grove of evergreen mahogany trees, on the western bank of the seasonal Manzi River, Kuyenda has been kept deliberately simple; a haven where guests can experience safari largely as it was in times gone by. Its position here is due to a permanent, natural waterhole nearby, making it a prime location for wildlife. Guests can settle down in the lounge area and enjoy a perfect vantage point with incredible views over the sandy riverbed and neighbouring plain, where abundant African wilderness activity is witnessed each day. Many guests travel to Kuyenda simply due to sharing their experience with Phil Berry, one of the Zambia's best and most legendary guides. Phil, and his ever-hospitable partner Babette Alfieri, are the extraordinarily talented couple who regularly run the camp. Phil has lived in the bush since 1975 and is a renowned expert on many safari subjects, keeping detailed notes on all the information he gathers. His particular passion is for the endemic Thornicroft giraffe, and is able to recognise over 200 individuals by their neck markings. Many guests return year after year as it is a real honour to share a campfire with someone so knowledgeable and passionate about the bush. Activities at Kuyenda can include day and/or night drives, and there’s plenty of wildlife to make these productive, but the emphasis tends to be on exciting and varied walking safaris; exploring the secluded ebony and mahogany groves, or visiting the lunar landscape of the mudflats and natural salt springs. Walks can be taken through shady riverine forest along the banks of the Luangwa River, interspersed with wide open dambos where breeding groups of elephant can often be found. With some of the South Luangwa's most diverse and breathtaking landscape situated around Kuyenda, no two outings will ever be the same. There is usually plenty of wildlife, and combined with extremely high quality guiding, walking here really can be a big-game safari. One aspect that many guests appreciate is the amount of animals that come into camp. There are often zebras, impalas and Thornicroft giraffes grazing on the plains in front of camp, and elephants often pass through, notably munching on the reedwork walls from time to time. Hippos and hyenas can often be heard at night, as well as the roaring of passing lions. Lovingly rebuilt each season, the guest accommodation at Kuyenda is essentially four classic African reed-and-thatch rondavels (circular hut). With three twin-bedded rondavels (queen-size beds) and one double (king-sized bed), Kuyenda ideally takes six guests, however groups of eight are accepted. The three rondavels with twin beds have views of the Manzi riverbed from their large, mesh-covered windows. The fourth, set slightly separate from the rest, has a king-size bed, from which guests can view an open plain favoured by herds of impala, puku, buffalo and elephant. All are simply furnished, with mosquito nets suspended above extremely comfortable beds, and floors dressed in gorgeous locally-made reed matting. At the back of each chalet, through a reed and mesh door, is an open-air bathroom with a sandy floor, conventionally plumbed twin basins and toilet, and a drum shower, which is filled on request in the age-old safari way. 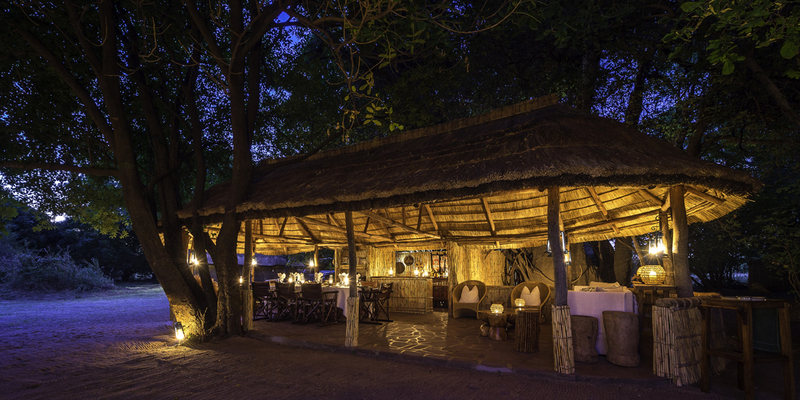 Kuyenda's thatched main area is deliberately simple, which adds to the rustic charm of the camp. It houses the bar, a lounge area with comfortable furniture, a small library of reference books and a dining table. A portable washstand to wash away the dust from the day is located nearby, and a campfire outside overlooks the plain beyond. The accommodation is rustic yet comfortable and spacious. Although guests don't come to Kuyenda for the rooms; they come for the walks, the game, the hospitality, and above all for the guiding, which is first-class.